When was the last time you thought about what it is in life that makes you truly happy? Have you ever sat back and wondered what it means to live your best life? On the contrary, have you ever considered what is stopping you from living it? Maybe it’s responsibilities, or perhaps it’s money. What if we told you that there was a way that you could eliminate responsibility, save money, and live your best life at the same time? For many people, the idea of living in RV is a far cry from the ideals of living your best life. You probably can’t even imagine going more than a month in an oversized vehicle, let alone several years. If you’re nodding your head, have you ever actually thought about what makes it sound so scary? Is it really any more horrifying than paying stacks of bills each month, cursing at people in rush hour traffic five days a week, and just blindly going through the motions of ordinary life? We’re willing to bet if you ask any full-time RVer, they will probably tell you that they would have never imagined how rewarding life on the road would end up being. Let’s explore a couple of different ways on how cheap RV living can completely change the way you think about both life and death. For so long, people have been spending nearly their entire life chasing financial freedom. By the time we are able to make decisions for ourselves, most of us are already in debt through either student loans, car loans, or even both! It is estimated that 1 out of 4 Americans collectively hold nearly $1.4 trillion in student debt. With interest rates varying between 5%-8%, it can seem nearly impossible to find a way to pay them off. For this reason, many recent graduates are turning to cheap RV living as a way to save money to pay off their student loans. 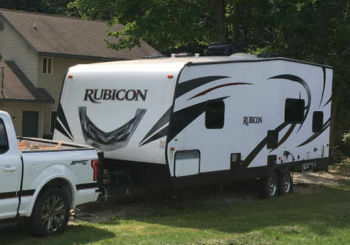 In fact, these young full-time RVers wrote an entire blog on how they were able to pay off $14,000 in student debt while living in their RV for a single year. There is also the pressure that society puts on us to own property. They do this by reminding us how much money we waste each year by paying rent. Buying a house is a huge risk within itself though. If you’re lucky enough not to be affected by the lower side of the unreliable real estate market, there is also the risk of some kind of natural disaster ruining your home. Just last year Hurricane Harvey caused $125 billion in damages to homes in Texas. One thing is for certain about owning property unless you are very wealthy, you will be stuck in the same location for many years before you start actually paying off a good chunk of your principal balance. Worse yet, if you plan to stay in your home till you pay it completely off, you will be stuck there for 30 years before making your last mortgage check. In the meantime, your wallet will be crying for years as you pay HOA fees, property taxes, and insurance in addition to your monthly mortgage. One of the reasons more people are becoming attracted to the idea of RV living is that you can completely pay off your “house” in just one year. While the average rent in the US is at an all-time high in 2018 at $1,405 per month, it’s possible to find a used RV or trailer for $16,000. Can you imagine never having to pay another rent or mortgage bill after your first year in your new home? Cheap RV living is one of the only options where this scenario is possible. Sure, one of the most difficult parts of RV living is learning how to live with less. If you have ever moved from an apartment into a bigger home, you are probably aware of the phenomenon of buying new furniture and decorations just to fill all the new empty space. You may have even taken out a credit card to pay for this furniture causing even more monthly bills that you have to pay for, in addition to your mortgage. With cheap RV living, your biggest expense is going to be the RV itself. The best part about buying an RV is that it already comes fully furnished! Although it is likely that you may have to replace the cushions every couple of years, they are going to be cheaper to replace than replacing multiple couches in your living room. 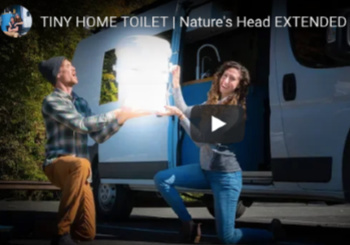 This is just one of many examples on how the minimalistic life that comes with RV living will ultimately save you money. Truth is there is so much life beyond materialistic things. In order to live a truly rich life, we have to break free from financial and materialistic pressures weighing us down on a daily basis. You’ve heard the phrase, “Money is the root of all evil.” Although there are many factors to this cliché statement, research has indicated that when someone loses 75% or more of their wealth, they become 50% more likely to die earlier no matter how much money they had to begin with due to “wealth shock”. People who live the cheap RV life, have mastered the art of not letting money control them. Unlike owning a home, you don’t need close to a six-figure income to live well in an RV. This means we don’t have to waste five-days a week sitting in traffic. We also don’t have to purchase new work clothes every couple of months to maintain our fresh professional appearance. Best of all, we aren’t required to be trapped behind a soul-sucking cubicle for 40 hours a week! The research may not be there, but spending extended amounts of hours behind a cubicle does seem to deteriorate our mental health. On the flipside, you might be surprised at how spending more time outdoors can improve your overall mental health. 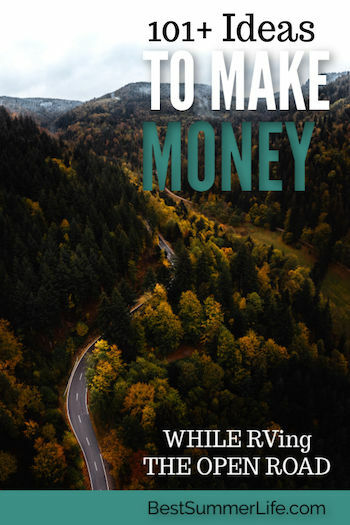 When people start to consider making the switch to full-time cheap RV living, one of the biggest obstacles is finding a source of income that will allow your life on the road. Truth is, there are so many options for exciting ways to make an income. Since RV living is less financially demanding than living in a normal home, you will find satisfaction in taking jobs that won’t drain your soul and are still capable of paying for your next move! We’ve talked a great deal about the benefits of financial freedom, but what we haven’t covered is more freedom overall! So many of us as humans tend to follow the same blueprint on what we think our lives should be. After working the typical 40 hours a week, then having to spend a couple of hours over the weekend going grocery shopping and doing yard work, doesn’t realistically leave a whole lot of time for us to do what we’re actually passionate about. If you’re lucky you may have the opportunity to go bike riding once a week at that pace. Any seasoned full-time RVer will tell you that the biggest impact full-time RVing has had on them, is just the absolute freedom that it creates to do whatever it is you like, whenever you’d like. Living the cheap RV life means less time doing the dreaded house chores, and more time for doing what you love, whether it’s hiking, fishing, or mountain biking! Recreational activities asides, RVing also allows us to recharge our souls by spending more time having meaningful interactions. This can include spending time visiting distant relatives across the country, volunteering at different non-profit organizations or even helping with natural disaster rescue efforts around the country. It should go without saying, that when you are constantly exploring the unknown, there will be plenty of stress involved. 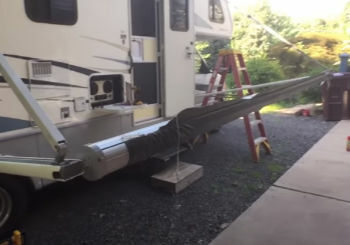 This can come from a wide variety of issues that will happen while RVing such as getting lost, not being able to have a stable internet connection or something breaking down on the RV. . . again. At first, it’s almost expected you will have moments of uncertainty and may freak out a bit. After dealing with these random issues that arise on a regular basis, we start learning how to handle them efficiently and collaboratively as a team. Not only does this make us a much better problem solver, but naturally we also learn how to better cope with not always sweating the small stuff because we’ve already given up so much to pursue this lifestyle. Plus, every time you figure out how to fix something on your own without having to depend on hiring other people or looking it up on the internet, it’s a huge boost to your self-confidence! Making friends as an adult can be tough. When we’re surrounded by all the negativity in the media it can be hard to trust random strangers anymore. Truth is, there are tons of great people out there, they just don’t ever make the headlines. 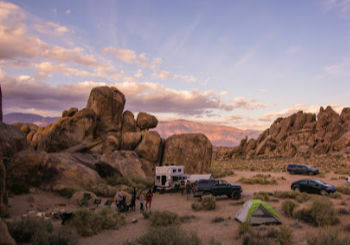 The RV life provides such a unique experience that is great for making new friends around the world who are already doing the same thing as you! No matter where in the world you decide to park, if you are ever feeling lonely, there are huge networks of bold adventurous RV travelers just within arm’s reach waiting to meet you over some barbecue! Whether you’re in your 20’s or in your 60’s, you’ll never have a problem making new friends on your journey. You’ll be surprised at how many genuinely nice people from all different backgrounds you will encounter as you travel life on wheels. As you continue to meet new people outside your typical bubble, you will be introduced to a variety of new cultures, ideas, and perspectives. It really is a breath of fresh air as these new friendships continuously motivate us to become the best versions of ourselves towards other RV travelers we meet along the way. As the costs of everyday living continuously rise, so does the age of retirement. Unless a medical problem exists, most people are choosing to work till they are 70 years old. By that time, traveling becomes more difficult because you aren’t likely going to be as nimble as you were in your 20’s and 30’s. Remember, you only live once. Why wait till your retirement to check those bucket list items off? The RV life contains a world full of endless possibilities. From walking along the edge of the Grand Canyon, snorkeling the reefs in the Florida Keys, to hiking to the top of the Rocky Mountains, there are so many adventures life has to offer us in such a short lifetime. You can literally hit all 48 of the contiguous states in your first year RVing and still have a lifetime worth of sites to visit, places to hike, and other adventures waiting to happen. Truth is, we don’t typically think about death. When we do, we naturally think of it as something that happens to other people, or something that won’t happen for a long time. For many people, to fear death is to fear the unknown. Will there be life after death? Or will everything we once knew just come to a complete end? Unfortunately, as much as we don’t want to hear it, things do happen. Not everyone is capable of living out their full life, and you never know what is going to happen tomorrow. If you were to have your last breath today, would you be satisfied with the quality of life you have lived up to this point? Through pursuing the RV lifestyle, we already know what it is like to give up almost everything to face the unknown. What we found, is that by facing our fears and learning how to live self-sufficiently in the wilderness throughout so many foreign places, we have learned the ultimate lesson for human life. That is, giving up the material life and trading it for a rich meaningful life instead. Therefore, we are no longer afraid of death. Because we have already experienced the true meaning of life!